Escape From Witchtropolis, the new record by Espectrostatic, conjures the balance of horror and frivolity captured in the thriller Berberian Sound Studio (2012). In the film, director Peter Strickland periodically cuts between a tight shot of lead character Gilderoy, a foley artist played by Toby Jones, wailing a knife back and forth into the frame—like Hitchcock’s famous Psycho sequence—as he tracks a murder scene and a wide shot of Gilderoy that reveals the source of all the grisly, bone-gnashing sound effects: fruits and vegetables. Likewise, Escape From Witchtropolis is full of its own watermelons and cabbages, according to Espectrostatic mastermind, Alex Cuervo. “I love dark and spooky stuff, but I usually try to include some playful elements and some variety as well,” Alex Cuervo said of his sound. Inspired by industrial sludge trotters Godflesh, postrock, krautrock, rocking chair band Verma, and horror soundtracks like that of Les Revenants by Mogwai and even the Broadcast-scored Berberian Sound Studio, Cuervo wields a haxan cloak on his new release to arrive at destination not too far from the ‘70s soundscapes of Tangerine Dream. “Around the time I was writing Escape From Witchtropolis, I was taking a Composition for Film and TV course, so a few of the tracks began as school assignments,” Alex said on writing the album. While Escape may not share the cohesion that Rubycon might since it was not necessarily written with a specific narrative in mind, each song does explore the same universe, or maybe the same region of a universe, as though Cuervo wanted to discover every hidden corner of Mordor rather than the entirety of Middle Earth. Opener “Removing the Bandages” unravels like a slow and ominous climb up a hill that never fully reveals what lies on the other side. The title track pulses and bops with the glee of a 12 year old in a goblin suit. “The Goddamn Apocalypse” closes the album with a lament to the lost souls lingering about in some purgatory, or so it sounds. Escape from Witchtropolis ultimately tackles darkness with the same sense of optimism and celebration that Mexico deals with death on the Day of the Dead. For now Cuervo is writing albums as Espectrostatic, but he’s got a larger vision for the project. Alex Cuervo seems to have found a new set of tools: John Carpenter’s synthesizers, and never have they sounded so chilling nor so bright. 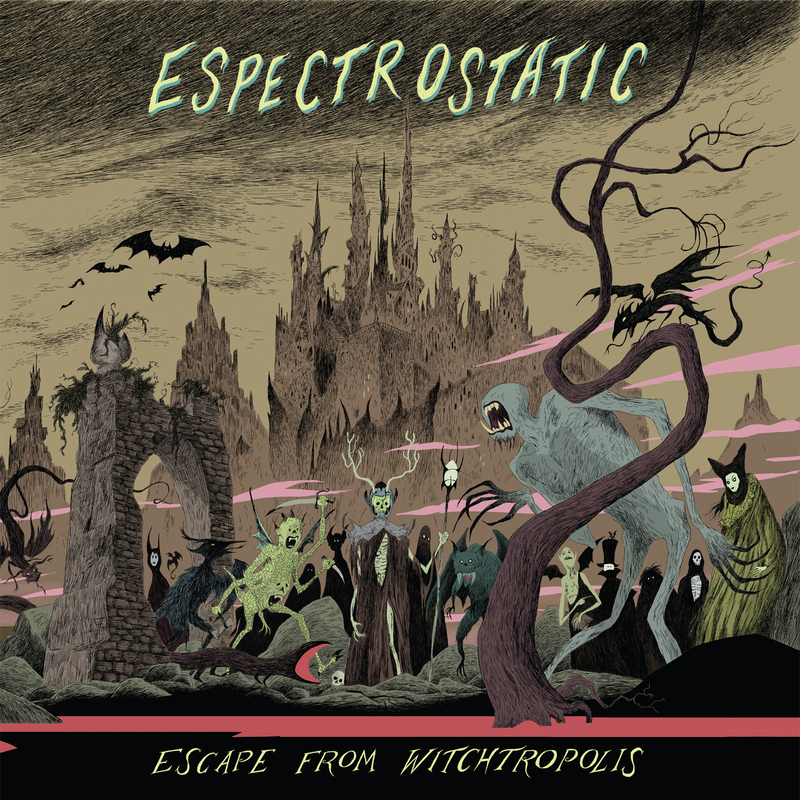 Espectrostatic’s Escape From Witchtropolis is out now on Trouble In Mind.